With a beautiful view of the Sahyadri Hills in Mulshi is this quaint and peaceful resort, Malhar Machi, perfect for anyone looking for a quick but comfortable stay. A mountain resort, it makes for some of the best views of the mountain landscapes, the blue lake and lushness it surrounds itself in. Mulshi, located four hours away from Mumbai, is a little village that will offer quiet and calm. Though post-monsoon makes for the best season to experience the aftermath of the fresh lovely rain swept greenery, the resort is open all year round. 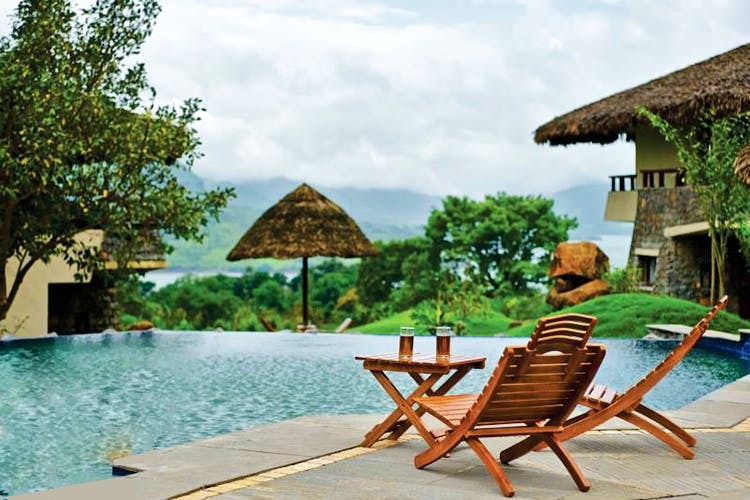 Flanked by the Sahyadri range and the Mulshi lake, the resort offers comfort and luxury. Go to Malhar Machi to unwind and relax. It offers all sorts of activities for the patrons like horse riding, a swimming pool overlooking the valley (including a separate one for kids), lawns to relax in, spa, rustic village experiences and bonfire, if requested. They offer five types of cottages: Maharaja, premium, bougainvillea cottages (and an additional one for families), Maharaja dormitory, and premium dormitory. The bougainvillea cottages start at INR 11,200, and are our favourite. Though it may be slightly on the upper end, this one is for the ones who’re looking to splurge on a peaceful getaway. All the prices are inclusive of taxes and breakfast, lunch, high tea, and dinner. What makes it even more awesome is all the vegetables used for the dishes are organic as they grow it themselves in the resort. This, then, tick marks the healthy and organic quotient for people as well. If you’re still making your weekend plans, head to Malhar Machi for some quiet time in Mulshi surrounded by mountains, lake and tucked away in a resort of luxury.